Living with my best friends is single-handedly the best thing about University. I was extremely fortunate in my first year to be put in a flat with a bunch of people who are now my closest friends. We literally do everything together, all the time, and I absolutely love it. Also, before we start. if you're interested, you can see my student room tours here and here. That being said, student housing itself is not quite so much of a good experience. Don't get me wrong, my halls last year were absolutely incredible, it was like living in a fancy hotel/apartment suite for a year, and I had no complaints to make about any of it. Fast forward to this year, our first year in a privately rented student house, and things aren't quite so idyllic. Firstly, student housing is cold. There's no getting around it. It's not very well insulated, and the houses on the whole aren't very well looked after either. Oh, and bills now make up a part of your monthly budget, so unlike in halls where they were included, we all tend to be fairly wary not to have it on too much.. But, with a cold house comes damp and mould - two things my room is full of. Yummy, right? Where I live, the majority of student housing is terraced housing on quite a few really long roads. Now, this is great because it means all your friends live in pretty close proximity, and going out and getting taxis home is an absolute doddle. It's not so great when all the walls are really thin and you can hear next door having a lit party as you're trying to sleep before an exam the next day. Student houses are noisy. As much as you and your housemates try and keep on top of the house, and try to keep it clean, it's impossible for it to ever be spotless. 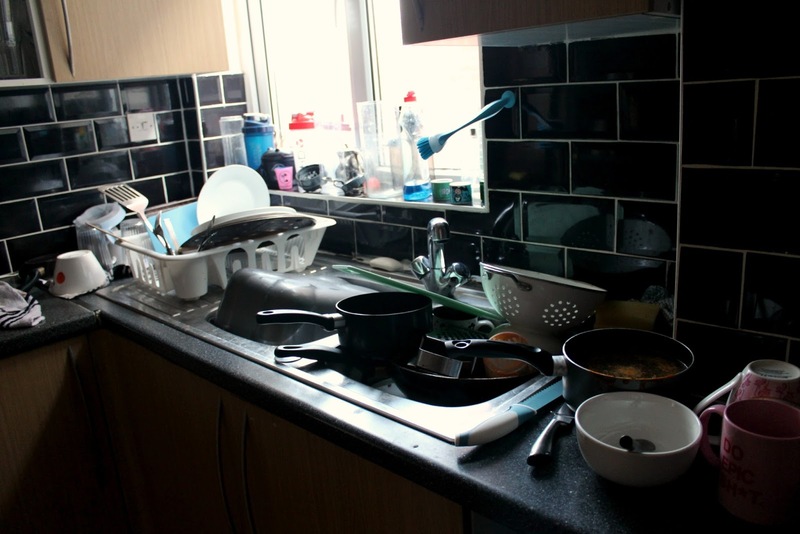 There's always washing up to be done and rubbish to be taken out, despite trying to keep on top of it. Have you just spent an hour cleaning the kitchen? Ah well, give it five minutes and there'll be a whole load of new mess to clean up. But, for me, the worst part of living in a student house is the pests. At the beginning of the year we had company in the form of rats, and the newest addition to our house is slugs. Lovely isn't it. Yeah, so I know this post hasn't particularly sold the whole university lifestyle, but it's genuinely been the best time of my life and I wouldn't have it any other way... After writing all this it would only be fair to offer you some tips on how to choose the perfect student house, you're welcome.